You will earn 551 Reward Points. Earn 1 reward point for every 1 dollar spent.
. The exterior is fabricated of heavy gauge type 430 stainless steel with a #4 nish. Legs are black phenolic. The PX-14 measures 19 5/8" (240mm) wide by 16 1/2" (419mm) deep by 9 7/8" (251mm) high overall. The PX-16 measures 24" (610mm) wide by 20 1/2" (521mm) deep by 9 7/16" (251mm) high overall. The interiors are constructed of heat tolerant aluminized steel, welded to form a single unitized body. The entire oven is insulated with 1" (25.4mm) thick industrial grade felt. 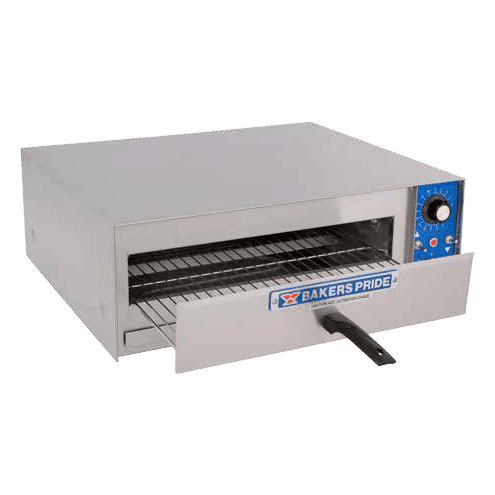 The PX-14 baking rack measures 13 1/4" (337mm) wide by 13 7/8" (352mm) deep while the PX-16 baking rack measures 17 5/8" (448mm) by 17 7/8" (454mm) deep. Two independently controlled incloy-heating elements provide top and bottom heat with up to 1500 watts for the PX-14 and up to 1800 watts for the PX-16. Available in 120v or 208-240v, single phase. 6' Cord and plug provided in standard voltages. International voltages available. Ovens are stackable. 1-Year limited parts and labor warranty included. This handy Bakers Pride PX-16 HearthBake Series Oven will cook any item quickly and evenly. This oven runs on electricity. It is a powerful appliance with a wattage of 1.8 kilowatts. This stainless steel oven is 9.88 inches tall, 24 inches wide, and 20.50 inches deep. I'm in the process of opening a small sandwich shop and I'm looking for a good sized toaster oven where I can toast the sandwich fast in less than a minute. Will this oven serve that purpose?